When you open up the mail, on the right hand side, you’ll notice a pane, titled People, which will mention people who are in the To list of the mail AND also are in your contact list. Each such contact can be clicked upon to show recent activity for that user. When you click on any one user, the resulting pane in the same space, will display the last mails you send/received from that contact, along with options to send mail, call, chat and others. The feature (algorithm working behind the scenes) also captures if something is being talked about some event, meeting, and neatly grabs the related details, and gives you the option then and there to add the event to your Google Calendar. 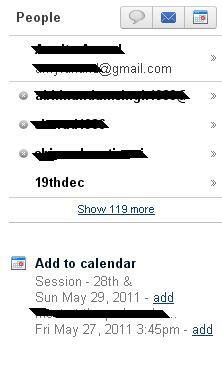 Nice neat additions Gmail. Keep up the good work. Many of you would not have noticed that the word beta is no more coming with a lot of Google apps like Gmail, Calendar, Docs, Talk. Google finally decided to take these google apps including Gmail out of Beta. It has been more than 5 years since Gmail’s launch on April 1, 2004. Millions of users are already using it and a larger percentage of that have been loyal to Gmail to the point that Gmail has become the primary email service for them. I am one of those. I have been using most of Google Apps frequently in my daily life. Google Docs have replaced my dependence on MS Word, MS Excel. It’s not that I am using that in Office but for everything personal, I prefer to use Google Docs. When Gmail and Google Talk were launched, it pulled me away from my then primary Yahoo account. I no more log on to YM, except occasional for the sake of it.